Nassau County Executive Edward P. Mangano and Acting Nassau County Police Commissioner Thomas C. Krumpter presented certificates of completion to 185 police graduates. Welcome in the 185 police graduates of the Nassau County Police Academy! Photo by: NCPD, via Twitter. Hempstead, NY - May 31, 2016 - Nassau County Executive Edward P. Mangano and Acting Nassau County Police Commissioner Thomas C. Krumpter presented certificates of completion to 185 police graduates at a graduation ceremony this evening, Tuesday, May 31, 2016, at 6:00 PM at David S. Mack Sports and Exhibition Complex at Hofstra University, Hempstead, NY. 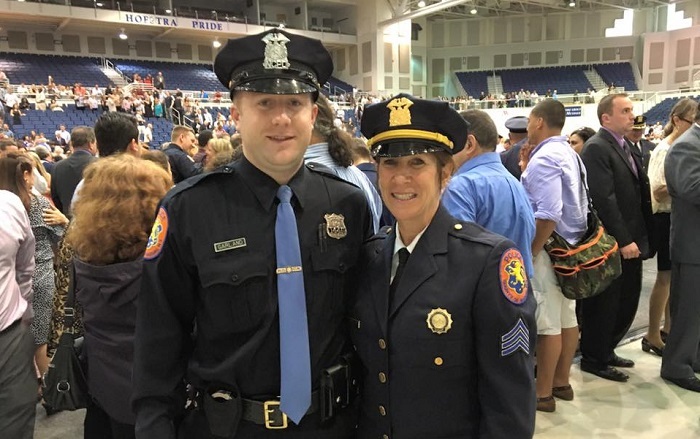 Detective Sergeant Jo Ann Distler presented her old shield to her son, Police Officer Bryan Garland, tonight after his graduation! Photo: Nassau County Police Department, via Faceboook. This is the largest class of graduates in over 20 years. The recruits completed 7 months of intense law enforcement training at the Nassau County Police Academy and of the 185 graduating, 175 are members of the Nassau County Police Department and 10 are graduating to Village and City Departments. Subject: LongIsland.com - Your Name sent you Article details of "2016 Police Recruit Graduation is the Largest Class in Over 20 Years"